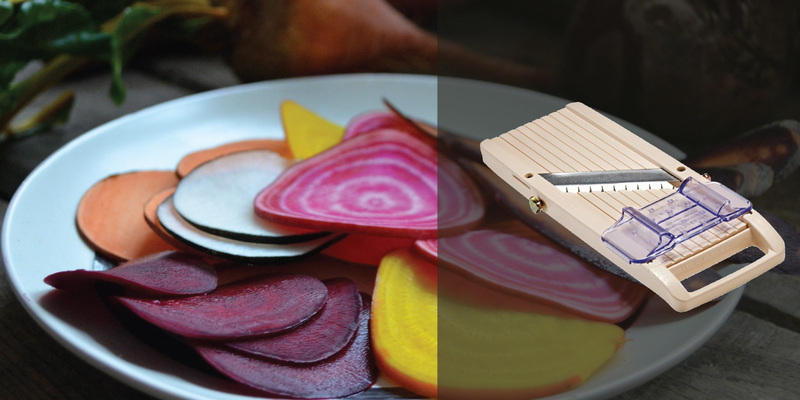 Create gourmet dishes effortlessly, with the professional Bemriner Mandoline Slicer, which slices vegetables and fruits into equal and even slices. The stainless steel permanent slicing blade shreds cabbage for quick and easy homemade coleslaw and cuts potatoes, tomatoes, and onions rings neatly, with very little skill and effort compared to using a knife. Comes with 3 interchangeable blades. The fine serrated blade creates tasteful garnishes. The medium serrated blade cuts uniform julienne strips for stir-fry vegetables and the coarse serrated blade makes crisp chunky cuts of root vegetables such as potatoes, beetroots and radishes. The Bemriner Mandoline Slicer is easy to use with a firm steady handle and a finger-guard, which protects the fingers from the stainless steel blades on the cutting surface. A must have for any kitchen. Perfect for professional and household use. Made in Taiwan. Time saving - chops large quantities of fruit and vegetables in minimal time. Safety Feature - No electric power. Quick and Easy blade changing. Blades come in a plastic sleeve for safe and easy storage when not in use. Interchangeable blades are easy to remove for easy cleaning. Fine serrated blade - Suitable for slicing fruit or vegetable garnishing strands for professional looking meals. Medium serrated blade - Perfectly sliced vegetables for stir fries and julienne salads, vegetable pasta and more. Suitable for most vegetables including peppers, onions, zucchini, beetroot and more. Coarse serrated blade - Makes perfect chunky strips for most vegetables such as potatoes, beetroot, cucumbers, carrots etc. Thin potato slices and other vegetables for potato chips. Slice carrots and peppers for salads. Slice lemon for lemon-flavored water. Make fresh fruit or vegetable salad. Slice cabbage perfectly for Coleslaw. Cuts any vegetable into thin slices and strands. Slice onions for onions rings. 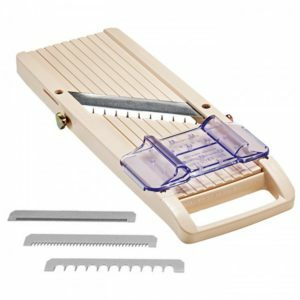 To change the blade, turn the Bemriner Mandoline Slicer upside down. Loosen the screws on the side of the Bemriner Mandoline Slicer, by turning them anti-clockwise, insert the blade with the serrated side facing down. Turn the Bemriner Mandoline Slicer slicer upside down, Loosen screws (located slightly above the blade insertion slot, towards the handle) by turning them anti-clockwise simultaneously, to gradually increase the cutting thickness. Cut the produce several times to see if the desired thickness is met. If not adjust accordingly. Note: the maximum thickness is 3 mm. Cutting surface area of W = 9.5 cm x L = 35 cm x H= 2.4 cm.